Timme Hosting Review 2019: Is Timme Hosting a Good Hosting? Timme Hosting is a website hosting company based in Germany. They offer a premium service with many features geared towards experts and high volume websites. 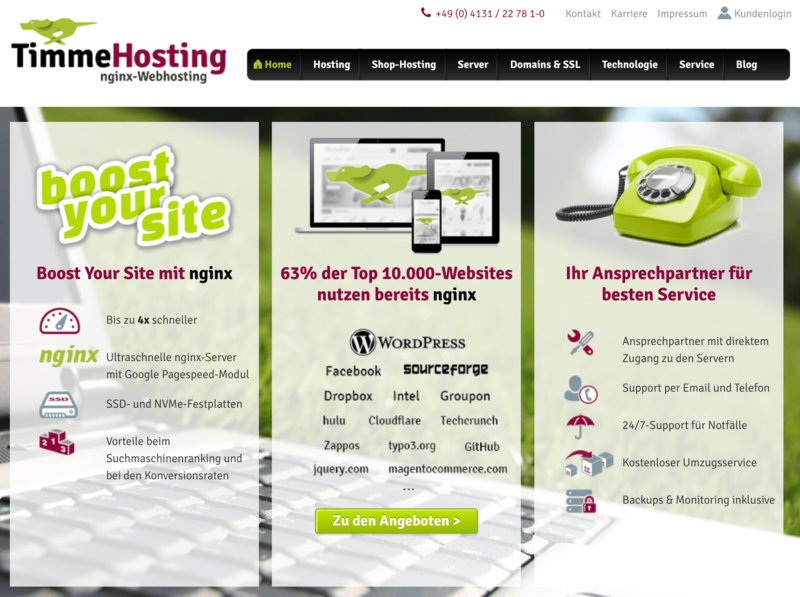 Founded in 2000, Timme Hosting is German hosting provider aiming to deliver reliable and fast website hosting. Whilst they don’t advertise how many customers they currently have, they do mention that they are co-operators of some very large websites with millions of page views per month, and they clearly have a good understanding of the hosting requirements for enterprise-level websites. Their website is available in German, but they also provide support in English. Timme Hosting is a premium website hosting provider. Their extensive range of packages would suit both beginners and enterprise-level websites, and they include Contao hosting, Drupal hosting, TYPO3 hosting, WordPress hosting, and e-commerce hosting. Not to mention managed servers, dedicated servers, and cloud hosting. It’s clear that Timme Hosting uses top quality hardware and infrastructure, including their own data center in Germany. They use SSDs with read-rates of up to 550 MB, write rates up to 500 MB, and up to 100,000 I/O operations every second, which means less disk failure and faster website load times. They use Nginx because the page load speed is four times faster than other website servers. Whilst beginners might miss having a website builder or one-click installer, experts will enjoy the array of features aimed at them including PHP (5.3 to 7.2), SSH access, FTP, and a development environment. Somewhat surprisingly, they don’t offer support for advanced scripting languages like Ruby on Rails and Python. Timme Hosting also offers full e-commerce hosting for JTL, Magento, OXID, PrestaShop, and Shopware. And what’s more, for growing companies they offer great packages that grow with you, such as their Scale Package that allows CPU cores, memory, and disk space to increase and decrease according to your needs. Their website and services are primarily geared toward expert users, so beginners might find the language a little complex. Timme Hosting’s prices are expensive when compared to both local and international providers. However, considering the expert-level features, this could be a great fit if you need a scalable hosting plan for a serious online presence. Contracts are offered on monthly, quarterly, semi-annual, annual, or biennial billing, but it’s not clear if longer terms attract a discount. They offer a 14-day free trial (so you can effectively try before you buy) and free website migration. They do not offer live chat on their website, which is a shame, but they do offer 24/7 emergency technical support by telephone and email. Business hours are not clearly advertised, so we have to assume standard working hours, Monday to Friday, for non-emergency enquiries. My emails have always received helpful responses in English. Timme Hosting is aimed at serious website owners who anticipate high volumes of traffic. They are more expensive than others, but you’re paying for top quality infrastructure with a focus on page loading speeds. Wondering how Timme Hosting stacks up against other Web Hosting companies? Enter any other Web Hosting company and we will give you a side-by-side comparison.